Since readers love to see what books their favorite authors recommend, you can use Prolific Works to show your support for another Prolific Works author! You can write blurbs for other authors in Group Giveaways you have joined, and other authors can write blurbs to show their support of your work. Visible blurbs will be displayed on both your Author Page and on the landing pages of Group Giveaways you join, so that they can be seen by readers. When you submit your book to a Group Giveaway on Prolific Works, you’ll have the option to show your support by blurbing an author in that Group Giveaway. 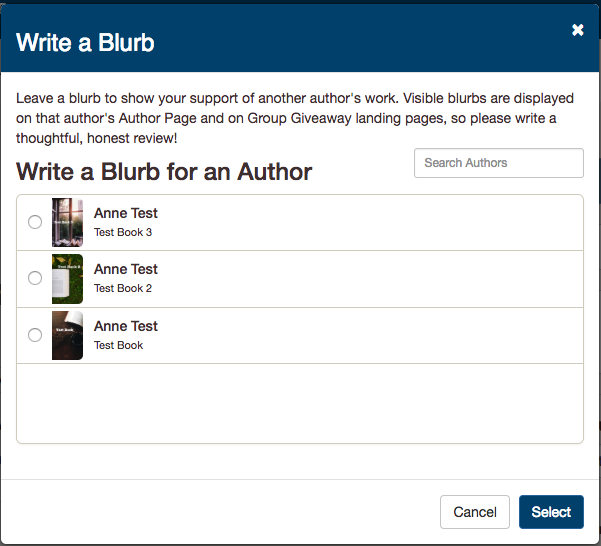 If you don’t want to write a blurb right away, you can always click the “Write a Blurb” button on the Group Giveaway details page when you’re ready. Choose the author you’d like to blurb, and then press the “Select” button. Note: You will not be able to blurb any authors that you have previously written blurbs for. 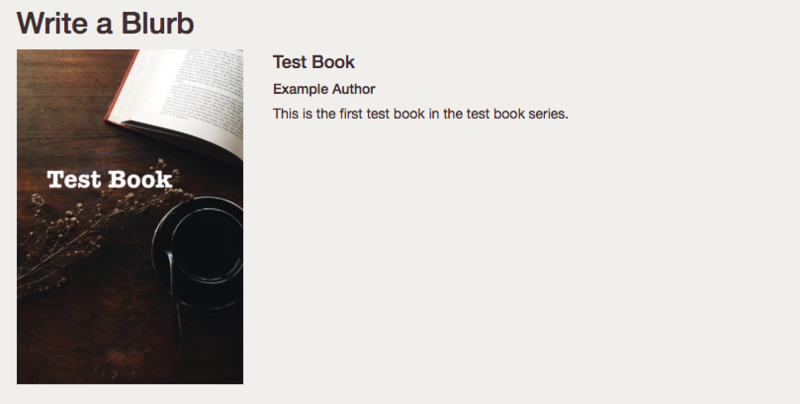 Once you select an author, you’ll be taken to a page with the author’s book and description. Here, you will be able to select the pen name you will use to write the blurb. Blurbs are tied to your pen names rather than your author account name, and you cannot edit your choice, so be careful when deciding which pen name you want to use! Write your blurb in the box provided, and then click “Submit” to submit your blurb to the author. If you would like to see blurbs that have been written for other authors in the Group Giveaway, click the “View All” button. On this page, you can view all of the visible blurbs that have been written for authors in this specific Group Giveaway. Any visible blurbs will also appear on the Group Giveaway Details page. Blurbs will be shown within the pop-ups for individual books on the Group Giveaway landing page, under the book description, so that readers can see what authors are saying about each other’s work! The most recent blurbs will appear first. If a Prolific Works author writes a blurb for you, you’ll be able to see it by clicking the “Blurbs” tab. You can also see any blurbs you have written for other authors. Click on the “Blurbs Received” button to view any blurbs that have been written for you. Here, you will be able to read the blurbs you’ve received and decide whether or not you’d like them to be visible. Visible blurbs will be shown on Group Giveaway landing pages and on your Author Page. Press the teal check box on the right to make the blurb visible. Make sure you click the check mark in the resulting pop-up box to ensure that the blurb will be visible! You can always change your mind and hide the blurb later. Note: Visible blurbs will be marked with this green “Visible” tag. If you want to hide the blurb, just click the red "X" and confirm your choice. You can always make the blurb visible again later. Any blurbs you have set to “Visible” will be shown on Group Giveaway landing pages and Details pages, and will also be shown on your Author Page! If you’d like to look at all of the blurbs you’ve written for other authors, click the “Blurbs Written” button on the Blurbs page. On this page, you’ll be able to look at all of the blurbs you have written for other authors, ordered from oldest to most recent.